"BBS news ran an article a few years back about a russian guy at a university that built petrol powered boots, these used a small piston shooting out the base to propell the wearer forward, lenthening the strides and hence moving faster. " "Here's an interesting picture I found on Pink Tentacle; I don't have any information about it, other than the link below the picture. I think It's an interesting illustration of what a pedomotive might look like. 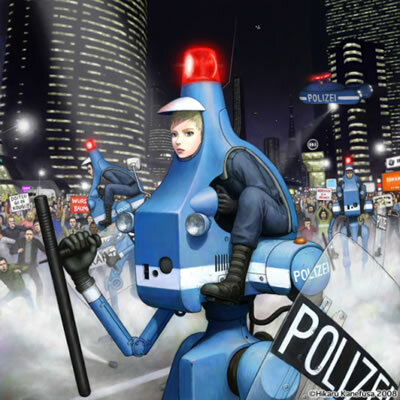 POLIZEI ROBOTER [Hikaru Kanefusa] "